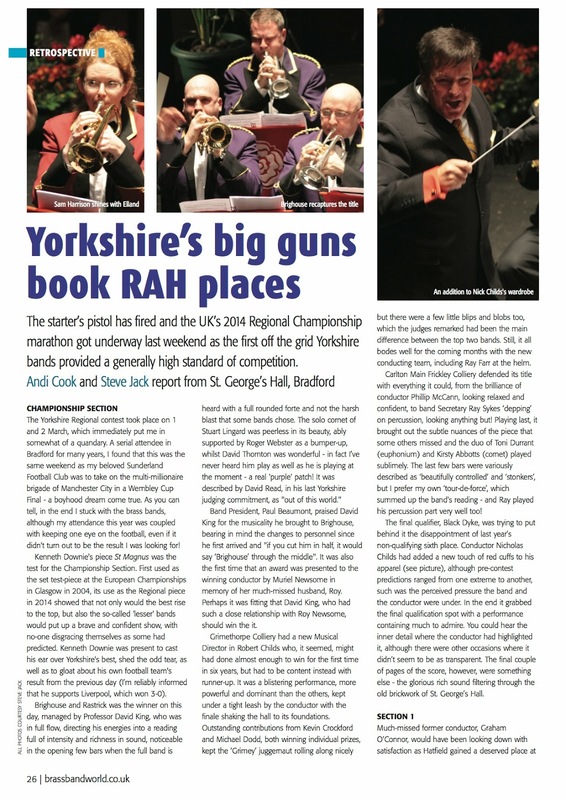 The starter’s pistol has fired and the UK’s 2014 Regional Championship marathon got underway last weekend as the first off the grid Yorkshire bands provided a generally high standard of competition. Andi Cook and Steve Jack report from St. George’s Hall, Bradford. The Yorkshire Regional contest took place on 1 and 2 March, which immediately put me in somewhat of a quandary. A serial attendee in Bradford for many years, I found that this was the same weekend as my beloved Sunderland Football Club was to take on the multi-millionaire brigade of Manchester City in a Wembley Cup Final - a boyhood dream come true. As you can tell, in the end I stuck with the brass bands, although my attendance this year was coupled with keeping one eye on the football, even if it didn't turn out to be the result I was looking for! Kenneth Downie's piece St Magnus was the test for the Championship Section. First used as the set test-piece at the European Championships in Glasgow in 2004, its use as the Regional piece in 2014 showed that not only would the best rise to the top, but also the so-called 'lesser' bands would put up a brave and confident show, with no-one disgracing themselves as some had predicted. Kenneth Downie was present to cast his ear over Yorkshire's best, shed the odd tear, as well as to gloat about his own football team's result from the previous day (I’m reliably informed that he supports Liverpool, which won 3-0). Brighouse and Rastrick was the winner on this day, managed by Professor David King, who was in full flow, directing his energies into a reading full of intensity and richness in sound, noticeable in the opening few bars when the full band is heard with a full rounded forte and not the harsh blast that some bands chose. The solo cornet of Stuart Lingard was peerless in its beauty, ably supported by Roger Webster as a bumper-up, whilst David Thornton was wonderful - in fact I’ve never heard him play as well as he is playing at the moment - a real 'purple' patch! It was described by David Read, in his last Yorkshire judging commitment, as "out of this world." To read more about the rest of the field in our March edition, simply subscribe using the secure PayPal link above. You'll even get a 25% discount for subscribing online!